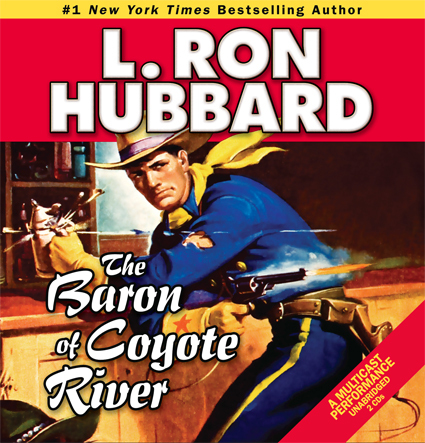 BARON OF COYOTE RIVER …This Was the WILD WEST ! Starring the voices of: Martin Kove, Bruce Boxleitner and Jim Meskimen. BARON is about a wronged gunslinger and his unlikely compadre who fight against illegal cow stealing,Corrupt cavalry and mistaken identity. This sounds like a real time reading of an old dime novel that was about Custer,Jesse James or some other gunslinger of the day. The backup tale on this audiobook is REIGN of the GILA MONSTER,Although shorter this tale held my interest perhaps more and its the one that had ALL THE STARS. I heard the image of RICHARD’Jaws’KIEL, as the character in story …And Richard was no where near this audio tale,But,It could have been him…Except L.Ron wrote this in the’40s and Richard would have been a kid and nowhere near his famous size of today. Good script and voices and amusing premise to plot. Posted by GUESTAR on February 17, 2010 in audio books and tagged cagney & lacey, how the west was won, karate kid. Hi Chris. Great review. Thanks and the actors will really appreciate it.